On Saturday October 27th, Tufts AmnestyInternationalhad the opportunity to attend the Amnesty International Northeast Regional Conference(NERC). This annual event draws together human rights advocates from around New England to engage withpressing human rightsissuesand grapple with potential solutions. With plenaries, workshops, speakers, and opportunities to vote on Amnesty actions regarding human rights abuses, NERC is a great opportunity to get involved on a deeper level with today’s human rights issues. NERC began with two plenaries. The first, entitled “Nonviolent Resistance in the Global Struggle to Defend Human Rights,” was presented by Jamila Raqib of the Albert Einstein Institution. In her lecture, Raqib focused on how to effectively take action in the fight for human rights. She emphasized the importance of intentionally selecting and sequencing different methods of nonviolent action and the necessity of establishing and articulating a common vision. The second plenary, “Families Belong Together: How We Can Support Refugee Families in Crisis,” addressed the migrant caravan and President Trump’s rhetoric and actions surrounding it. The panel also delved into the international refugee crisis and provided a variety of ways for advocates to get involved. NERC featureda wide variety of workshops.With programs as diverse as “Act OUT: Theater as Activism,”“Lobbying 101: State and Federal Advocacy,”and “North Africa and the Sahel: Human Rights Overview and Call to Action,”the workshops incorporated creative, legislative and informational approaches towardshuman rights education and action. Members of Tufts Amnesty International were able to choose from eighteen different workshops across two timeblocks. This allowed individuals to pursue topics which they were passionate about, and share what they learned with the group when we reconvened. In addition to workshops, two panels were presented at NERC: “Artificial Intelligence and the Future of Human Rights,” and “Russia’s Human Rights Crisis: Beyond the Headlines, Beyond the Collusion.” The majority of Tufts Amnesty went to the panel about human rights in Russia. This session drew attention to the human rights abuses occurring within Russia, as these are largely underrepresented in American media. 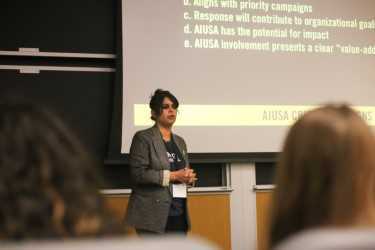 After the plenaries, workshops, and panels, NERC attendees participated in caucuses –with one caucus designated for local groups and another for student groups –and resolutions.This provided Tufts Amnesty members with a concrete opportunity for action and enabled us to voice our opinions about important matters within the Amnesty community. Overall, the Amnesty International NERC was an inspirational and educationalexperience.